Dr. Aboul Fetouh perceived liberalism is a good indicative of the current state of affairs in Egypt, where grey is white just because it is not black. In another words, benign conservatism is liberalism because we can swallow its milder rhetoric without feeling the urge to vomit. For years, the mainstream religious establishment has resisted any reform of religious thoughts. Liberal scholars who advocate Ijtihad as the way forward to reconcile traditional texts with modern day life were mocked, bullied, dismissed or even worth murdered. For example; a reformist like Gamal El-Banna (despite being the Brother of Muslim Brotherhood founder Hassan el-Banna) was shunned by many, Nasr abu Zayd was forced to leave the country and settle abroad until he died, and Faraj Fouda was tragically assassinated when he dared to voice different views. Many of them advocated reformation of Islamic thoughts, and tried (rightly or wrongly) to articulate different views of Sharia that protect the society without impinging on basic human rights. Sadly, these reformists’ voices were silenced in a country blurred by collective conscience. As a result, there are only various shades of conservative Islam within the Islamic map of Egypt. c- the wider group among the Brotherhood affiliates who endorsed the group in the parliamentary election, but they are not necessarily willing to commit to the Brotherhood and may endorse other candidates, like Aboul Fotouh, if convinced that his chances are better. a-the hard-core Salafists: These are true followers of Salafi scholars who actually read religious text, study school of thoughts and actively involved within different Salafi parties. It seems that many of them will support their leaders endorsement of Aboul Fotouh. b- the soft-core Salafists: These make up the larger group who choose to follow their preachers out of affection and trust without exploring the details of their perspectives. Most of the main Salafi constituents fall under this category. For them, Salafism is a general loose term that means embracing literalism as a way to achieve religiosity without venturing into details. How they will choose their candidate? Will they follow Salafists parties and back Aboul Fotouh? Possibly yes, though not necessarily. This wider group of none-political affiliated Egyptians who voted for Islamic candidates in the parliament but are willing to shop around before voting in the presidential election. They usually focus on the spiritual aspect of the religion and are naturally declined to join in politics. Their preferred candidate is still unknown. Yesterday, in the first ever-Preseidential debate , Aboul Fotouh reinforced what he already mentioned in his manifesto, a clear commitment to Sharia, but of course he didn’t elaborate on what exactly he means. The Maqasid ( goals) of Sharia as I wrote before is a very elastic subject that raises many questions. I doubt very much that Abuoel Fetouh has even thought about embracing liberal Islamic philosophy with its rationalism and freedom of thoughts; instead, he placed stronger emphasis on the justice of Islamic law, a very appealing slogan in a country rife with corruption. The only hint of liberalism I detected from Aboul Fotouh was his support to the rights to change religious beliefs, however, later in the debate; he reiterated his opposition of Iran attempt to spread Shia sect of Islam in Egypt. As a liberal I find that hard to swallow, opposing the brutal Iranian regime should not be extended to rejection of Islamic inter-sect conversion. I wished Aboul Fetouh was quizzed about his views of Faraj Fouda & Nasr Abu Zeid, bthough I am not expecting him to embrace them, but he should at least protect the right of Muslims to voice different theological opinions without fear for their lives. No one should be murdered or persecuted for expressing controversial views in post–revolution Egypt. On several occasions, Aboul Fetouh has promised he would guarantee “Freedom of creativity” despite he has never articulated what creativity means in his opinion? I wonder how Aboul Fotouh stance regarding the elusive charge of “insulting Islam” and how he would prevent another Adel Imam saga? So far, Abouel Fotouh vague platform has earned him the endorsement of many from “perceived liberals” like Wael Ghonium to various Salafi groups. It is certainly true, that most of these endorsements are based on political calculation rather than ideological factors. However, the ultra-conservatives can be potential troublemakers in the future if they perceived any delays in Sharia implementation. Shadi Hamid described Aboul Fotouh as A Man for All Seasons and that Sharia for him “is everything and nothing all at once.” For me, that is not the description of a unifying figure, but a political hustler who are trying to appeal to wide variety of audience all at once. There are still plenty of question marks surrounding his assumed Liberalism, is it real or just a garnish for a very conservative manifesto? For now, he remains Mr. “Relative,” one who successfully proves the endless interesting applications of Einstein’s theory. This entry was posted in Egypt and tagged #Egypt #Presidentialelection #AboulFotouh #Islamists #Salafistss. Bookmark the permalink. Nervana, well said. A reminder that the diaspora serves as the compass for those remaining. Presidential debates are a part of political campaign. The participants use spin and slogans which they hope would appeal to as wide electorate as possible. Candidates make promises, which are too difficult to fulfill when in office. The candidate Obama said that he would meet the President of Iran and solve easily the problems between the two countries. President Obama is much tougher on Iran than President Bush was. 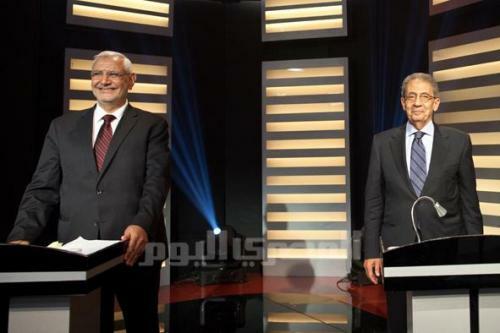 In the debate yesterday none of the two candidates made a convincing impression, as to whether they have in their own mind a clear picture as what Egypt is and as to their ability to rule. Sharia is quite flexible system of law and ruling. On every issue one can get several fatwas, mostly contradictory. I doubt whether the two candidates of yesterday or others, who have even a slight chance to become President, are able or even would like to transform Egypt into another Saudi Arabia or Iran. Egypt has many almost insurmountable problems. It is hard to draw conclusion from one or several debates, but I doubt if Mr. Fatouh has the ability to tackle them and become an effective leader of Egypt. The grade for his performance in American scale is, in my mind, C-. Thank you, Nervana, for another good article. We know Abul Fotouh is a liar – he uses deception to get into power; and he is Islamist to the core. He wants to appeal by his deception to all sorts of peoples, even Copts. But we know that kind of masters of subterfuge, and we have a healthy, instinctive rejection for those.